Beginning in 1867, definitive Mexico stamps heralded the downfall of the short-lived monarchy and the return of the republic. President Benito Juarez, popularly elected in 1858, resumed his role as the head-of-state. He would be elected for four more terms, and with his role in the fight against the monarchy, he would eventually be regarded as one of the greatest heroes in Mexican history. Right after the fall of the monarchy and the restoration of the republic in early 1867, some of the definitive Mexico stamps of 1861 were provisionally overprinted "Mexico" in Gothic lettering. Two authenticated examples are shown above. 1/2 R. (1867 - Sc. #35) - Black on Buff. 01 R. (1867 - Sc. #36) - Black on Green. 02 R. (1867 - Sc. #37) - Black on Pink. 04 R. (1867 - Sc. #38) - Red on Yellow. 04 R. (1867 - Sc. #39) - Red on White. 08 R. (1867 - Sc. #40) - Black on Red Brown. 08 R. (1867 - Sc. #41) - Green on Red Brown. 1/2 R. (1867 - Sc. #42) - Gray on Grayish Blue. 01 R. (1867 - Sc. #43) - Blue on Grayish Blue. 02 R. (1867 - Sc. #44) - Green on Grayish Blue. 04 R. (1867 - Sc. #45) - Rose on Grayish Blue. Almost all of the 1867 provisional overprints are rare, and forgeries of them are abundant. Certification of authentic examples is an absolute necessity. Between 1868 and 1872 only eleven major types of Mexico stamps were issued, but with the tremendous number of cataloged varieties, these issues could almost be a philatelic specialty on their own. The images shown below will only feature the major denominations of each of the stamps. The varieties will be described in their appropriate catalog detail tables. 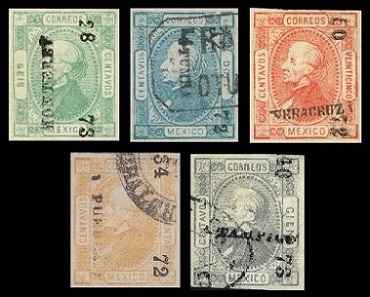 The six definitive Mexico stamps shown above were issued beginning in 1868. They are lithographed on tinted paper. Varieties will appear in the tables below. All of these Mexico stamps were overprinted with the district name, district number, and an abbreviated date. The common design features the portrait of Miguel Hidalgo y Costilla, regarded as the "Father of Mexican Independence". The Scott catalog attributes, for stamps with thin figures of value, without a period after the numerals, that are imperforate, and that are printed on normal paper, are as follows. 006 C. (1868 - Sc. #46) - Black on Buff. 012 C. (1868 - Sc. #47) - Black on Green. 025 C. (1868 - Sc. #48) - Blue on Pink. 050 C. (1868 - Sc. #49) - Black on Yellow. 100 C. (1868 - Sc. #50) - Black on Brown. 100 C. (1868 - Sc. #51) - Brown on Brown. The Scott catalog attributes, for stamps with thick figures of value, with a period after the numerals, that are imperforate, and that are printed on normal paper, are as follows. 006 C. (1868 - Sc. #58) - Black on Buff. 012 C. (1868 - Sc. #59) - Black on Green. 025 C. (1868 - Sc. #61) - Blue on Pink. 050 C. (1868 - Sc. #62) - Black on Yellow. 100 C. (1868 - Sc. #64) - Black on Brown. The Scott catalog attributes, for stamps with thick figures of value, with a period after the numerals, that are imperforate, and that are printed on very thick paper, are as follows. 012 C. (1868 - Sc. #59a) - Black on Green. 025 C. (1868 - Sc. #61c) - Blue on Pink. 050 C. (1868 - Sc. #62d) - Black on Yellow. 100 C. (1868 - Sc. #64b) - Black on Brown. The perforation of Mexico stamps began during this issue, with the perforation types being serrate, square, pin, and regular. Some of the perforation types were not suitable for the narrow spacing between the stamps, so many examples can be quite crude in appearance. Three perforated examples are shown in the image above. The Scott catalog attributes, for stamps with thin figures of value, without a period after the numerals, that are perforated, and that are printed on normal paper, are as follows. 006 C. (1868 - Sc. #52) - Black on Buff. 012 C. (1868 - Sc. #53) - Black on Green. 025 C. (1868 - Sc. #54) - Blue on Pink. 050 C. (1868 - Sc. #55) - Black on Yellow. 100 C. (1868 - Sc. #56) - Black on Brown. 100 C. (1868 - Sc. #57) - Brown on Brown. The Scott catalog attributes, for stamps with thin figures of value, without a period after the numerals, that are perforated, and that are printed on very thick paper, are as follows. 012 C. (1868 - Sc. #53b) - Black on Green. The Scott catalog attributes, for stamps with thick figures of value, with a period after the numerals, that are perforated, and that are printed on normal paper, are as follows. 006 C. (1868 - Sc. #65) - Black on Buff. 012 C. (1868 - Sc. #66) - Black on Green. 025 C. (1868 - Sc. #68) - Blue on Pink. 050 C. (1868 - Sc. #69) - Black on Yellow. 100 C. (1868 - Sc. #70) - Black on Brown. The Scott catalog attributes, for stamps with thick figures of value, with a period after the numerals, that are perforated, and that are printed on very thick paper, are as follows. 006 C. (1868 - Sc. #65a) - Black on Buff. 012 C. (1868 - Sc. #66a) - Black on Green, Black on Buff (error). 025 C. (1868 - Sc. #68c) - Blue on Pink. 050 C. (1868 - Sc. #69c) - Black on Yellow, Blue on Pink (error). 100 C. (1868 - Sc. #70b) - Black on Brown. Forgeries of many of the 1868 Mexico stamps were made from new plates. They have clear, sharp impressions, and they have more facial shading lines than the originals. Care should be taken, when buying any of the more expensive varieties of these stamps. Beginning in 1872, some of the 1868 Mexico stamp issues were also overprinted with "Anotado" in script letters. An authenticated example is shown above. 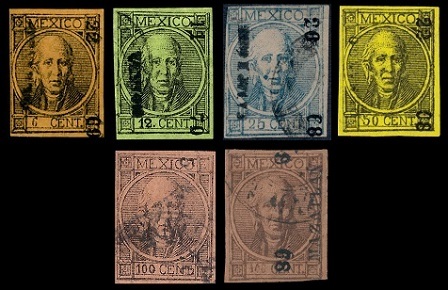 Most of the 1872 "Anotado" Mexico stamps are rare, and authentic examples are seldom encountered. Forgeries of the overprint are abundant. Certification of authentic examples is an absolute necessity. The Scott catalog attributes, for stamps that are imperforate, are as follows. 006 C. (1872 - Sc. #71) - Black on Buff. 012 C. (1872 - Sc. #72) - Black on Green. 025 C. (1872 - Sc. #73) - Blue on Pink. 050 C. (1868 - Sc. #74) - Black on Yellow. 100 C. (1868 - Sc. #75) - Black on Brown. The Scott catalog attributes, for stamps that are perforated, are as follows. 006 C. (1872 - Sc. #76) - Black on Buff. 012 C. (1872 - Sc. #77) - Black on Green. 025 C. (1872 - Sc. #78) - Blue on Pink. 050 C. (1868 - Sc. #79) - Black on Yellow. 100 C. (1868 - Sc. #80) - Black on Brown. The 25 C. denomination, both imperforate and perforated, exists on pelure paper (Sc. #73a & #78a). The five new Mexico stamps shown above were issued beginning in 1872. They are lithographed on either white wove or laid paper, and they have a moire pattern printed on the back. Other varieties will appear in the catalog tables below. Two different types of paper watermarks exist for some of these Mexico stamps, as follows. LA + F Watermark - The letters stand for "La Croix Frères", the name of the paper manufacturer. The watermark consists of double-lined, block capitals that are 13 mm high. A single stamp will show only a small portion of the watermark. PAPEL SELLADO Watermark (WMK. 150) - The watermark consists of large, script, capital letters across the sheet of stamps. A single stamp will show only a portion of one or more of the letters. The denominations on these Mexico stamps are spelled-out in words. For those that are not familiar with Spanish, here are the written Spanish equivalents of the numbers. The Scott catalog attributes, for stamps that are watermarked PAPEL SELLADO, that are printed on white wove paper, and that are imperforate, are as follows. 006 C. (1872 - Sc. #81) - Green. 012 C. (1872 - Sc. #82) - Blue. 025 C. (1872 - Sc. #83) - Red. 050 C. (1872 - Sc. #84) - Yellow, Blue (error). 100 C. (1872 - Sc. #86) - Gray Lilac. The Scott catalog attributes, for stamps that are watermarked PAPEL SELLADO, that are printed on vertically laid paper, and that are imperforate, are as follows. 012 C. (1872 - Sc. #82a) - Blue. 025 C. (1872 - Sc. #83a) - Red. 050 C. (1872 - Sc. #84b) - Yellow. The Scott catalog attributes, for stamps that are watermarked LA + F, that are printed on white wove paper, and that are imperforate, are as follows. 006 C. (1872 - Sc. #81a) - Green. 012 C. (1872 - Sc. #82b) - Blue. 025 C. (1872 - Sc. #83b) - Red. 050 C. (1872 - Sc. #84d) - Yellow. 100 C. (1872 - Sc. #86a) - Gray Lilac. The Scott catalog attributes, for stamps that are watermarked PAPEL SELLADO, that are printed on white wove paper, and that are pin-perforated, are as follows. 006 C. (1872 - Sc. #87) - Green. 012 C. (1872 - Sc. #88) - Blue. 025 C. (1872 - Sc. #89) - Red. 050 C. (1872 - Sc. #90) - Yellow, Blue (error). 100 C. (1872 - Sc. #92) - Gray Lilac. The Scott catalog attributes, for stamps that are watermarked PAPEL SELLADO, that are printed on vertically laid paper, and that are pin-perforated, are as follows. 025 C. (1872 - Sc. #89b) - Red. The Scott catalog attributes, for stamps that are watermarked LA + F, that are printed on white wove paper, and that are pin-perforated, are as follows. 006 C. (1872 - Sc. #87a) - Green. 012 C. (1872 - Sc. #88a) - Blue. 025 C. (1872 - Sc. #89a) - Red. 050 C. (1872 - Sc. #90c) - Yellow. 100 C. (1872 - Sc. #92a) - Gray Lilac. The Scott catalog attributes, for stamps that are unwatermarked, that are printed on white wove paper, and that are imperforate, are as follows. 006 C. (1872 - Sc. #93) - Green. 012 C. (1872 - Sc. #94) - Blue. 025 C. (1872 - Sc. #95) - Red. 050 C. (1872 - Sc. #96) - Yellow, Orange, Blue (error). 100 C. (1872 - Sc. #98) - Gray Lilac, Lilac. The Scott catalog attributes, for stamps that are unwatermarked, that are printed on vertically laid paper, and that are imperforate, are as follows. 050 C. (1872 - Sc. #96) - Yellow, Orange. 100 C. (1872 - Sc. #92a) - Gray Lilac, Lilac. The Scott catalog attributes, for stamps that are printed on thin, grayish blue, watermarked paper, and that are imperforate, are as follows. 012 C. (1872 - Sc. #94c) - Blue. 025 C. (1872 - Sc. #95c) - Red. The Scott catalog attributes, for stamps that are unwatermarked, that are printed on white wove paper, and that are pin or serrate perforated, are as follows. 006 C. (1872 - Sc. #99) - Green. 012 C. (1872 - Sc. #100) - Blue. 025 C. (1872 - Sc. #101) - Red. 050 C. (1872 - Sc. #102) - Yellow, Orange, Blue (error). 100 C. (1872 - Sc. #104) - Gray Lilac, Lilac. The Scott catalog attributes, for stamps that are unwatermarked, that are printed on vertically laid paper, and that are pin or serrate perforated, are as follows. 012 C. (1872 - Sc. #100a) - Blue. 025 C. (1872 - Sc. #101a) - Red. Of course, forgeries exist of most of the 1872 Mexico stamps described above. Care should be taken, when buying the more expensive varieties.